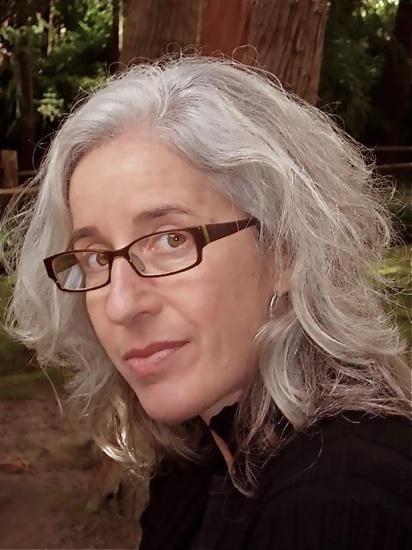 San Francisco-based poet Julie Bruck was born to American parents in Montreal. The life experiences of being an anglophone in Quebec, an assimilated Jew in Protestant Westmount, and more recently, a Canadian in America have, she says, positioned her as an outsider, looking in on society. Bruck’s perspective lends eloquence to Monkey Ranch, her third collection of poems—and this year’s winner of the Governor General’s Literary Award for English-language poetry. The book offers concise-but-revealing sketches of the fascinating animals that human beings are; the poems strip our familiar, daily encounters down to their peculiar bones, revealed through Bruck’s witty, considerate, and sometimes heartbroken vision. In my early twenties, I was studying visual arts and art history. I took one fiction class and realized that I was terrible at it. I was really interested in those little lyric moments—catching and magnifying small things through language. So I went to a poetry class, and I loved it. In the end, it was not very different from visual arts—I was still putting a frame on things and thinking visually, but in language. How do you pick the moments you write about? I think the moments pick me, in a funny way. I get drawn to a particular incident or a moment, or the language I encounter on the street—bits of overheard conversations, a line on the news, something curious or provocative. Engaging in language helps me forge some kind of understanding. I like to say that I was born bewildered, and that writing is how I create some order in what I’m seeing around me. So you’re processing through your writing? What I think I’m doing is transcribing the movement of mind as I undergo an event. [My] poem “How to Be Alone” came about because of this crazy language in a parenting manual about how to put a child to sleep. The line in the manual was, “There is no more today,” which I found terrifying. But I’m not interested in these poems just being transcriptions of what happened to me. A poem about letting a child cry itself to sleep can be about any paternal or maternal feeling of powerlessness. I hope I’ve made them solid enough that readers can own them. How do you craft your poems? Tell us about your writing process. I do a lot of free writing initially. I shouldn’t use this expression in the context of this book, but I try to get the monkey off my shoulder when I’m writing first drafts. I shun that inner critic who’s sitting there saying, “That’s a cliché,” or, “You’ve done this before,” and I write pages and pages. Then I have a conversation with the poem, and say, “Who are you? What are you really about?” It is often a question of trimming away the excess. I just hone and chip away, like a sculptor. How long did you take to write Monkey Ranch? This is thirteen years of work. I am a very slow writer. I moved and had a baby and made major changes, all after I turned forty. It took me a while to catch my breath and for my work to catch up. How has your writing changed in these thirteen years? Having a child has changed my writing. It felt like the stakes were raised—looking at the world that she was moving in, that she would ultimately move out into, without me. It made my connection to that wider world more urgent. And one of the side effects of parenthood was spending a lot of time with animals at the zoo, observing the commonalities between small children—who are still very creaturely and haven’t quite asserted their will—and animals. And that led to Monkey Ranch? Yes. I was accruing a stack of poems, and I began looking through them to see whether a book suggested itself. It was hard because I didn’t have a triggering event or any sequence to work with. Then, after I’d written the title poem, “Monkey Ranch,” I started to realize that this really was a book about us human monkeys: our imperfections, our loves, our insanities and everything else. One big monkey ranch—chaotic and cruel, but not without its beauty. It’s things that we don’t look at regularly, or that we don’t stop to think about very much, that I find intriguing. Like the phone ringing—who cares right? It’s apparently a big deal around here. I get obsessed with small things, because I think there’s something else at the root of the obsession, and I’m always interested to find out what it is. Can you tell me about a poem that got you through an obsession? “Missing Jerry Tang”—about a person we knew who went missing. It was unacceptable that we never found him. Meanwhile, the world goes on, people are feeding the ducks, and kids are making lists of what they see on their field trips, for posterity. That poem was my way of reckoning with what is against what ought to be. Is that what you’re contending with, again, in “Mutanabbi Street, Baghdad”? I wrote that poem for a project started by a San Francisco bookseller and poet who was determined that the Mutanabbi street bombing be marked and remembered. I basically listed and rearranged portions of a Washington Post story by Sudarsan Raghavan to create this one father-son moment. I am always drawn to suggest the larger picture of something, from a detail. That detail was just too much. That shoe. I think this book is also funnier than I’m making it sound, though. It’s a bit silly, the idea that having a truck can change everything. I wanted to close the tonal movement through the book with something racing forward. I didn’t want to end with a dying fall—the clichéd darkness ending. I wanted an energetic, defiant ending. This poem had that. And the joy of a dog, riding shotgun, with his head sticking out of an open window—that’s just pure, unabridged, undiluted joy. I wanted a piece of that on my monkey ranch.